Commonly used for: Excellent Credit, Hotel, Rewards, Travel. If you’re on the go and prefer Hilton hotels, the Hilton Honors American Express Ascend Card is a great option to have in your wallet to collect all sorts of bonus perks. The Ascend is the second tier of three personal cards offered by American Express for Hilton loyalists, boasting a dramatic 125,000-point bonus for new cardholders when you spend $2000 in the first three months of membership. Redemption value starts at 5,000 points per night at select hotels, so this is a tempting offer for those hoping to rack up free nights quickly. Add to that a free weekend night’s stay when you spend $15,000 in the first year, and you’re sitting pretty as a first-year cardholder. Racking up points can happen rapidly with the Ascend card, with 12x base points on the dollar for each stay at a Hilton portfolio hotel. The card also grants 6x points for spending at U.S. restaurants, U.S. supermarkets, or U.S. gas stations. All other eligible expenses accrue points at a rate of 3x on the dollar. While the other Hilton Honors card fees range from $0 to $450 a year, the Ascend is a good middle-of-the-road option with its $95 annual fee (See Rates & Fees), offering enough perks to make it worthwhile to a traveler who loves Hilton hotels, but doesn’t need the whole kit and caboodle. As an Ascend member, you are granted Hilton Gold Status, which enables you to earn 80% more points, every fifth night free when staying five or more nights and free room upgrades. Spend $40,000 on the card in a calendar year and get an upgrade to Diamond Status for even more royal treatment. At the outset, this card puffs itself up with big bonus point rewards, and it’s certainly tough to resist the introductory bonus. It should be noted, however, that the redemption rate may not be quite as rosy as it appears on the surface. While Hilton requires 5,000 points for the minimum number of points required per night for redemption, we found that to be a fraction of the number required for a night’s stay. A standard room at the Hilton Garden Inn at the Charlotte Airport listed the redemption rate at 31,000 points. You may be able to earn more efficiently with a cash-back rewards card. Bottom line: It’s a great card for the first year, and perhaps longer if you’re a big fan of Hilton, but only if the luxury perks add up for you. Points alone may not suffice for the long term. Hilton Honors American Express Ascend Card is a good option for travelers who are loyal to the Hilton portfolio of hotels and can benefit from the many additional perks that come with being a Gold member. If you prefer flexibility in hotel brands, or shy away from annual fees, you may prefer a general travel rewards card. 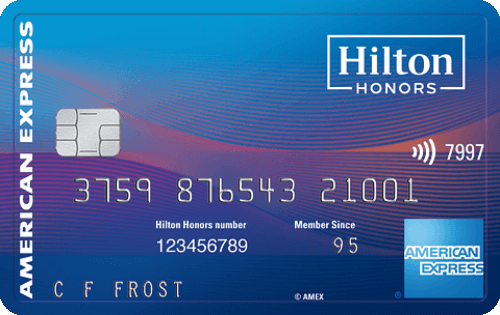 This card gives holders Hilton Honors Gold status, which grants 80% higher bonus points earned with each stay (18 points per dollar spent), and a fifth night free when booking a reward stay of five nights or more. Acquire Hilton Honors Diamond status when you spend $40,000 on eligible purchases within a calendar year. You can transfer your Hilton points to one of their airline partners, which may result in greater value than using for a hotel stay. Starting at 5,000 points, you can choose a combination of points and cash in 1,000 point increments to pay for a Hilton property hotel room. Numerous bonus perks to make frequent travel more comfortable. You cannot redeem your rewards for cash back, only for hotel stays, gift certificates or experiences through the Hilton portfolio. Redemption value of points is considerably lower than a cash back credit card. Variable APR of 17.99% to 26.99% based on creditworthiness. The balance transfer fee is $5 or 3% of the amount of each transfer, whichever is greater. A penalty APR of 29.99% may apply for at least six months after one or more missed payments or a payment is returned by the bank. A late fee of up to $38 may apply. Earn a Weekend Night Reward after spending $15,000 on purchases on your card in a calendar year. Complimentary Gold Status includes 80% bonus on base points earned from Hilton Honors when you stay, room upgrades, in-room high-speed Wi-Fi and a fifth night free on a standard room when five nights or more are booked using points. To help you travel in style, this card allows you to become a Priority Pass member, giving you access to over 1,200 airport lounges worldwide. Visit our Priority Pass guide to learn how to sign up and take advantage of the opportunity the next time you’ve got some time to kill before your flight. Roadside assistance, baggage insurance, and 24-hour Global Assist Hotline access are offered for any additional travel needs. This card comes with auto insurance and protections, cell phone insurance and access to extended warranties on eligible purchases. Cardholders also are eligible for exclusive pre-sale access to select entertainment events. To learn more on how to best utilize the benefits offered with this card, visit our Hilton Honors rewards guide.